HONOLULU (20 March 2017) Developing new fishing regulations for the expanded marine national monument in the Northwestern Hawaiian Islands (NWHI) and identifying marine species to be federally managed as components of the ecosystem are two key issues to be addressed at the 169th meeting of the Western Pacific Regional Fishery Management Council. The meeting runs tomorrow through Thursday from 8:30 a.m. to 5 p.m. in Honolulu and is open to the public. The Council includes the local fishery department directors from Hawai’i, American Samoa, Guam and the Commonwealth of the Northern Mariana Islands (CNMI), fishing experts appointed by the Governors and federal agencies involved in fishing-related activities. 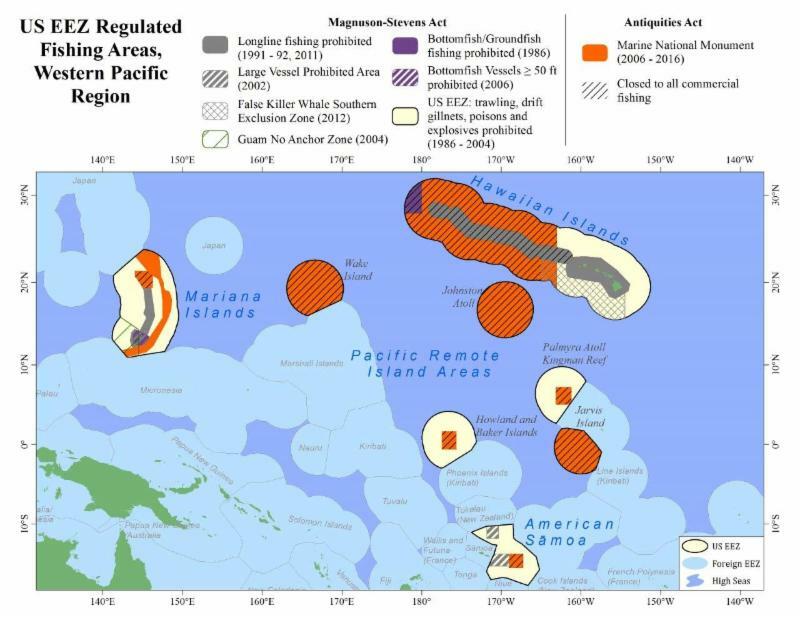 The Presidential proclamation under the Antiquities Act that expanded the Papahanaumokuakea Marine National Monument calls for closing offshore commercial fisheries from 50 to 200 miles around the NWHI, an area twice the size of Texas. The Hawai’i-based longline fleet is expected to redirect its fishing efforts to the high seas (beyond 200 miles from shore) or into the allowable longline fishing area 50 to 200 miles offshore around the main Hawaiian Islands. The Hawai’i longline fleet, which catches bigeye tuna and swordfish, is banned from 0 to 50 miles throughout Hawai’i. While the Presidential proclamation prohibits commercial fishing around the NWHI, it allows regulated non-commercial and Native Hawaiian subsistence fishing. As part of its decision-making process, the Council will consider the results of public scoping meetings that were conducted throughout Hawai’i in December as well as the recommendations of its advisory bodies. The Council’s Scientific and Statistical Committee (SSC), which met March 7 to 9 in Honolulu, recommends that existing data be explored, for example those from the former sport-fishing operation at Midway Atoll in the NWHI and the Hawaii tuna tagging project. It also recommends that the potential impact on protected species be considered as fishing effort is redistributed. The Council advisory bodies made up of fishermen and indigenous experts, which met March 15-17 in Honolulu, jointly support the removal of fishing provisions in the NWHI as well as other marine monuments in the region: Rose Atoll (American Samoa), Marianas Trench (CNMI) and Pacific Remote Islands (the US atoll and island possessions of Johnston, Palmyra, Wake, Baker, Howland, Jarvis and Kingman Reef). The group recommends that the Council continue to express its concerns to the new Administration regarding the impacts to fisheries from the monument designations and their expansions as well from military closures and other marine protected areas in the region. The second key item the Council will consider when it meets is determining which of the thousands of marine species in the region to manage using annual catch limits as targeted fish species and which to manage using other tools (for example, minimum sizes and seasonal closures) as ecosystem component species. The Council may endorse the SSC recommendation to form an expert working group to ensure the final listings take into account species of social, cultural, economic, biological and ecological importance. As part of the Council meeting, a Fishers Forum on Using Fishers Knowledge to Inform Fisheries Management will be held 6 to 9 p.m. on March 22 at the Ala Moana Hotel, Hibiscus Ballroom. The free, family friendly event includes informational booths, panel presentations and public discussion. For the complete agenda and meeting documents, go to http://www.wpcouncil.org/category/upcoming-council-and-advisory-body-meetings/ or email info@wpcouncil.org or phone (808) 522-8220. Western Pacific Regional Fishery Management Council: Secretary of Commerce appointees from nominees selected by American Samoa, CNMI, Guam and Hawai`i governors: Michael Duenas, Guam Fishermen’s Cooperative Association (Guam) (vice chair); Edwin Ebisui Jr. (Hawaii) (chair); Michael Goto, United Fishing Agency (Hawaii); John Gourley, Micronesian Environmental Services (CNMI) (vice chair); Christinna Lutu-Sanchez, commercial fisherman (American Samoa); McGrew Rice, commercial and charter fisherman (Hawaii) (vice chair); Dean Sensui, film producer (Hawaii); Archie Soliai, StarKist (American Samoa) (vice chair). Designated state officials: Suzanne Case, Hawai`i Department of Land & Natural Resources; Henry Sesepasara, American Samoa Department of Marine & Wildlife Resources; Richard Seman, CNMI Department of Lands and Natural Resources; Matt Sablan, Guam Department of Agriculture. Designated federal officials: Matthew Brown, USFWS; Michael Brakke, US Department of State; RADM Vincent B. Atkins, USCG 14th District; and Michael Tosatto, NMFS Pacific Islands Regional Office.